« Water vapour feedback is simply written into climate models as parameters? “For most developed nations, electricity accounts for something around 40% of total energy”. No. It’s somewhere between 20% and 25%. See for instance wikipedia. According to the US IEA, in 2016 the energy sector was responsible for 39% of the total primary energy consumption. When you refer to a source, you should include a link to the source you used. In their graph they helpfully give the amount of total energy as 97 quadrillion BTUs. Not x TWh or GJ. When I calculate that it out it comes to 28,400 TWh and the total electricity is 15% of that. Of course, now we need to consider the overall efficiency of electricity generation (i.e. energy into the electricity sector rather than electricity out) and so that is probably how the number ends up as 39%. On this site, rather than “see for instance, the internet” we do look for commenters to do some work and find + verify some data. on November 18, 2017 at 6:24 pm | Reply Mike M.
With respect to the 40% vs. 20%, it depends on how the accounting is done. Let’s say you burn 12 MJ worth of gas to heat homes and 8 MJ of gas to make 4 MJ of electricity. 40% of the gas burned went to make electricity. But 25% of the energy used (4 MJ out of 16 MJ total) was in the form of electricity. So is electricity 40% or 25% of the total? Some sources do it the first way (usually labelled ‘primary production’) and some do it the second way (‘end use’, I think). It gets worse when you consider different sources for electricity. Let’s say you replace the 4MJ from your gas plant with 4MJ from nuclear. End use does not change. But is primary production still 20 MJ or is it now 16 MJ (12 MJ gas + 4 MJ nuclear)? Some do it one way, some the other. Confusing. It’s certainly hard to find a consistent answer. Perhaps the different percentages are partly explained by using *supply* vs *consumption*, which are very different numbers. The US may be a bit of an anomaly in this matter (they love their juice). In 2014, world primary energy *supply* amounted to 155,481 terawatt-hour (13699.13 Mtoe). About 23,816 terawatt-hour (2483.47 Mtoe) of this number was in the form of electricity. This represents 15% in 2014. World primary energy *consumption* was 109,613 TWh in 2014, about 29.5% less than the total *supply*. That because much of the energy that is acquired by humans is lost as other forms of energy during the process of its refinement into usable forms of energy and its transport from its initial place of supply to consumers (i.e. losses to refining & transport). This represents 22% in 2014. Source: “Key World Energy Statistics” (PDF). IEA. 2017-05-28. p. 38. Converted on the basis of thermal equivalence assuming 38% conversion efficiency in a modern thermal power station. This generates kWh numbers that don’t match the published figures. I don`t know how realistic these storing ideas for Germany are. Dams are often quickly empted throughout the winter, and rely on snow melting in the spring, often to empty again in dry summers. So I don`t think the stored energy would be enough for both Norway and Germany in the winter. And the filling during the summer might not be enough. Prices are set according to the amount of water in dams in november, the precipitation in the winter, and the snow amount in mountans. So there could also be some economical complications. I noticed that there is no mention of the Jacobson, et.al. (2015) favored energy storage system, CSP-PCM (Concentrated Solar Power – Phase Change Material), for achieving 100% renewable electricity in the continental US. Maybe Germany is too far north for that to work. Or maybe Clack, et. al.’s critique of Jacobson is correct. Unless no judge will accept Jacobson’s libel suit, it will be decided in court. A very interesting paper, thanks. Just a note that my comment on limits at the end of the article were about the grid stability. I didn’t comment on how to backup the volatility – I’ve discussed that in many previous articles. I just made the assumption that Germany (and any other country seeking a high % of renewables) can buffer the volatility of wind farms with gas plants. These burn fossil fuels to generate power, but only when needed. Whether or not there is a more economic solution in pumped hydro is a practical question, based on cost (and perhaps some ideology as well). In the previous article – XIX – Behind the Executive Summary and Reality vs Dreams – we looked at a UK report and there was the hint there (in the report) that reaching 80% from renewables by using gas plant backups was problematic. But they didn’t show any calculations. There is also the option to ‘overbuild”. 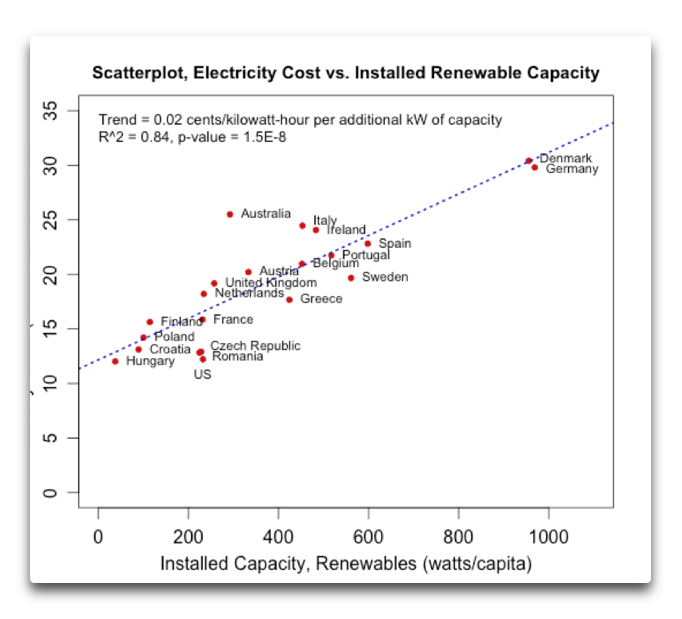 This was discussed in XIV – Minimized Cost of 99.9% Renewable Study. … and on that subject, Denmark & Germany are getting backup for their wind power volatility from their European grid connections. I want to highlight this paper, suggested by krmmtoday – Buffering volatility: A study on the limits of Germany’s energy revolution, Hans-Werner Sinn, European Economic Review (2017). 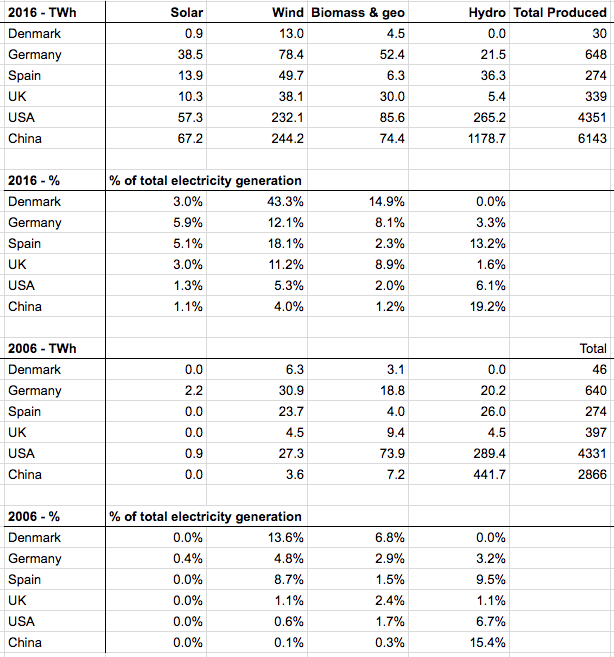 Well worth reading for everyone interested in the challenge of expanding Germany’s renewables to a much larger fraction of their electricity supply. Worth an article by itself, although most of his general points have already been covered in this series. The high cost of electric power partly results from the differing wholesale prices in Germany and France, and partly from taxes and a feed-in surcharge for green energy. The network companies have to pay the green producers the publicly administered prices, but when these prices exceed the wholesale price at the market, the excess is generally imposed as a surcharge on consumers, with a few exceptions for energy-intensive firms. The feed-in surcharge increased from 0.19 cent per kWh in 2000 to 6.35 cent in 2016, which was equivalent to a total subsidy of 24 billion euros. To put this figure into perspective, this represents about a hundred times the annual budget of government-financed Max-Planck Institute in Greifswald which runs an experimental nuclear fusion reactor, the Stellerator. Now going somewhat off topic, this is why economists mostly favor a “Pigovian tax” instead of a complex network of subsidies. That is, if you are going to promote renewables, then a long-term carbon tax makes the most sense. This is more likely to result in the most cost-effective solutions to the problem being promoted. It gets entrepreneurs putting their own/their investors’ money into solutions that will solve the problem – vs the government effectively picking what they believe is the right technical solution. This gives much more incentive to entrepreneurs to make nuclear fusion work, to invent a new battery technology and so on. The Alternative for Germany party (AfD), one of whose goals is to end the Energiewende immediately, received 13% of the vote in the last German election. A new study from the RWI Leibniz Institute for Economic research finds that 61% of Germans wouldn’t want to pay even €0.01 more per kWh to fund more renewables. (Lead editorial, Germany’s Green Energy Meltdown, Wall Street Journal 11/18-9/2017 (pay walled) On top of that, Germany isn’t going to meet its carbon emission reduction goals either. Click on USA and look at the ring in the picture, certainly no more then 20% of the energy used in USA is in the form of electricity. For me it looks like your story is about energy consumption. Correct, the article is about energy consumption, not electricity consumption. The total energy input is important. Thanks for the correction. And my compliments for all the good work you are doing! Sure there is always a “catch”. For instance if you compare a diesel car with an electric one the efficiency might be better for the electric car even including the energy used for transforming ” something” to electricity. But for heating purposes not so. I haven’t looked at solar cost yet. For the German price of around $5/GJ, the operating cost of gas over wind will be about $20/MWhr. The capital cost (based on a capacity factor of 25% which is higher than the German average of below 20%) works out to be $48/MWh lower for gas vs wind. The value was based on a 20 year life and an 8% capital cost. It’s easy to see that gas plants last a lot longer than that, but not sure about wind, so to me this is a little pessimistic for gas. So overall wind power costs $28/MWh more than gas – this is with a more favorable assumption about wind’s capacity factor than is actually achieved in Germany. Wind, as with solar, very much depends on where it is located – you can see in the linked article that wind power in Oklahoma, at an average of 41% capacity factor, reduces the capex cost from $58/MWh to $35/MWh. This reduction of $23/MWh would put wind in Oklahoma at about the same cost as gas power in Germany (gas power in the US is cheaper than Germany due to the $3/GJ in US vs $5/GJ). It also depends on whether you have to build new transmission lines, and whether the wind or solar is a small fraction of the grid output, or a large fraction. When it is a large fraction other costs are incurred – you need to keep backup generating capacity on standby and ramp it up and down, which reduces its life. You can read that wind is cheaper than fossil fuels and that solar is cheaper than fossil fuels. People repeat other people’s claims, no evidence needed. I see claims that the cost of generating solar electricity, based on bids in Mexico, are on the order of $20/MWh. But something looks fishy with the money. The bids include renewable energy credits, but it’s not at all clear to me who gets them. REC’s are worth money, I think. So if the bid is $20/MWh in cash plus REC’s, then the cost of the electricity is probably more than $20/MWh, I think, depending on how much can be realized from the sale of the REC’s. I’m not sure, though. The internet pages read like press releases, not analysis. In comparing Germany to USA, it would also be useful to look at the contribution that nuclear makes to the electricity sector. My understanding is that Germany is trying to reduce FF generation and at the same time reduce nuclear generation, making the task somewhat more difficult. In the meantime, Germany has increased solar+wind by 13% of total generation so their huge effort has been cancelled out by the nuclear drop so far. Fast forward to 2026 and they might still be in the exact same position on CO2 emissions – another 13% drop in nuclear (to nothing) and maybe a 13% increase in wind + solar. Actually getting an additional 13% will be tougher..
As far as German household energy use, it makes very little difference if all the electricity is from renewable sources or not. In terms of megajoules, only 13% of household energy use is electricity, 12,600 MJ/yr (0.0067€/MJ), but 30.6% of the cost. The majority is heating oil, 1400L/year, equivalent to 53,600MJ/yr (0.00166 €/MJ), or over 4 times as much energy but the about the same share of the annual cost, 31.8%. The rest is gasoline (0.0037€/MJ). Even if using a heat pump instead of resistive heating would improve the efficiency of electric heating, the cost would still be much higher than heating oil, not including the capital expense of installing a heat pump. It would also require a large expansion of generating capacity. I haven’t been able to find equivalent statistic for the US. My suspicion, though, is that at least part of the reason that more electricity is used per person in the US is because the US uses more electric powered HVAC.